For storage and labeling of personal items. 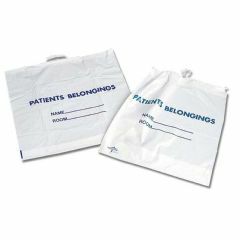 These durable bags hold patients’ clothing, jewelry, etc. during treatment. Select the snap-close bag with a rigid handle or a drawstring bag. Both can be hung from a wheelchair or gurney during transport to room. Size is 18" x 20" with a 3.5" gusset.